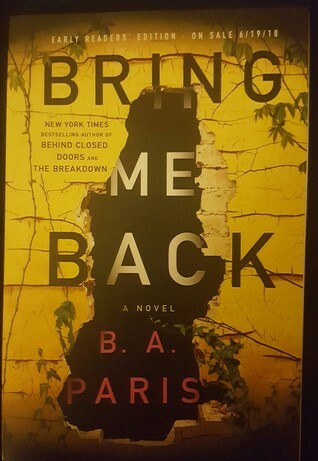 Today I'm sharing my thoughts about a recent read, Bring Me Back, the forthcoming psychological thriller from B.A. Paris, author of Behind Closed Doors and The Breakdown. This new book will be available on June 19, 2018. B.A. Paris’s latest psychological thriller centers around an unusual love triangle. There’s Finn—an at-times volatile man—and Layla and Ellen, sisters who are completely opposite in temperament and taste. Finn’s initial relationship is with Layla, who vanishes without a trace while the young lovers are returning to England from a holiday on the continent. After an investigation, Finn is cleared of suspicion of foul play by the police, and Layla’s body is never found. Years after Layla’s disappearance, Finn embarks on a romantic relationship with Layla’s sister, Ellen. Soon after the couple announce their engagement, mysterious signs and sightings raise questions about Layla’s fate and whereabouts: Is it possible that Layla has returned? If so, why now and where has she been for the past 12 years? What would such a turn of events mean for Finn and Ellen’s future? Or, on the other hand, is this merely a cruel hoax by someone determined to destroy Finn and Ellen’s relationship? The unfolding story is riveting and well-told: part one alternates between the present time and the last decade, filling in the back story; part two alternates between Finn and Layla’s voices, revealing their inner thoughts; and part three hurtles towards a stunning conclusion. Supporting characters add strong elements of suspicion and motive that kept this reader guessing and turning pages to the story’s end. With this latest novel, B.A. Paris presents her third outstanding, twisty tale, proving beyond doubt that she is a master of suspense and a formidable voice in the genre. Note: I received an early reader's edition from the publisher in exchange for an honest review. 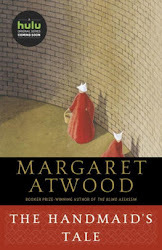 This Thursday Thoughts post was originally written and published by Catherine for bookclublibrarian.com. It cannot be republished without attribution. Retweeting and sharing of this original post on Google+ are appreciated.